The kindness and relative docility of most Fell Pony stallions is often remarked upon. One multi-supreme champion stallion was especially valued because he threw good-tempered offspring that young women could easily handle in the show ring. 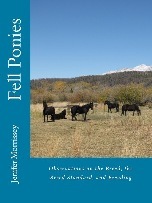 And with the majority of Fell Pony owners today being female, good-tempered ponies of all genders are important for the safety of pony and people alike and for the reputation of our breed. Why might it be that our stallions are generally so well-regarded? Here’s what Dr. Deb Bennett said in an article about the evolution of mountain horses in North America. I think it applies just as easily to the history of the Fell Pony in Cumbria. “Our pioneer ancestors had no time for difficult horses. They valued good-mindedness as much as soundness.” (1) I think it’s very likely that today we are blessed with good-minded stallions because for generations they have been selected for by hill breeders who had no time for challenging temperaments, no matter how good the pony was otherwise. Dr. Bennett then touched on a business case for producing good-minded equines. “All sectors of the horse industry would do well to remember that today, comparatively few people have the knowledge or experience to work successfully with horses who are flighty or aggressive. Any breed that consistently markets good-minded horses who are easy to break in and train is at an advantage now even more than in our great grandfathers’ time.” With fewer and fewer people taking up the equestrian life, it seems paramount to the success of any breed that good-mindedness be a focus. We with Fell Ponies may have an advantage! 1) Bennett, Deb, PhD. “In Praise of Good-Mindedness,” Equus, #489 June 2018, p. 70. More ponderings like this one can be found in my book Fell Ponies: Observations on the Breed, the Breed Standard, and Breeding, available internationally by clicking here or on the book cover.